Airplanes and Rockets website visitor Bob G. wrote to request that I post the articles for the Skyrida (October 1969 American Aircraft Modeler) and for the Minirod (February 1969 AAM). Says Bob, "I was building "Chipper II" (plans supplied by my brother-in-law) when you posted the plans for "Skyrida". The "Chipper II" is largely complete. 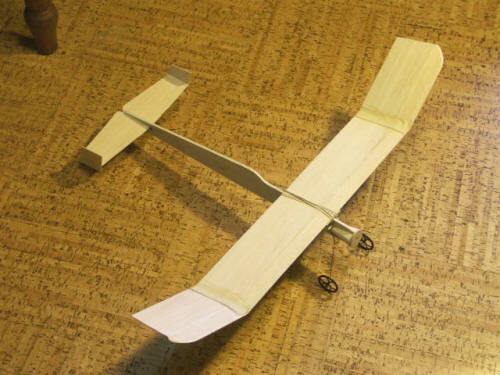 (photo attached) It is the first engine powered plane that I've attempted in 40 years. I've applied sanding sealer and dope. The only dope available here was clear, so I haven't painted it, and may not. I doped it in the garage, and it took a couple of days for the odors do dissipate, to my wife's disgust. So I opened the garage window overnight, and now it is 33 degrees in there. I haven't mounted the Cox .020 PeeWee yet, tho, and I probably won't until the Spring or Summer. I've bought the materials for "Skyrida", and plan to build it and "Minirod", so I need the engine as a guide to drill the mounting holes. And I want to run that old engine on a test stand first to become familiar with it again. And the freeflight flying field west of the airport is a cow pasture, and off-limits for a period in the Spring. Here is a thread about the Chipper II on the RCGroups website forum.